The California Court of Appeal on Thursday overturned a lower court ruling that had challenged teacher tenure and declared school employment laws unconstitutional. The nine student plaintiffs intend to appeal the ruling to the California Supreme Court, according to a statement from StudentsMatter, a group representing the students. 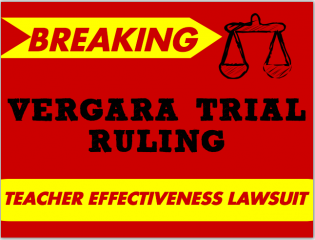 The three-judge panel unanimously reversed Vergara v. California, finding that there wasn’t enough evidence to show that minority students were more often subjected to ineffective teachers than other students. The judges acknowledged many problems in the school system, but couldn’t find it to be unconstitutional. This has been one of the most-watched decisions in public education. If Judge Rolf M. Treu‘s 2014 ruling had been affirmed, it could have up-ended teachers unions and laws the school districts have followed. In the lawsuit, nine students who were attending California public schools sued the State of California and several state officials, seeking a court order declaring various parts of California’s Education Code unconstitutional. After an eight-week trial and more than 50 witnesses, the judge ruled in favor of the students. The appeals court heard arguments and asked questions on Feb. 25 in downtown LA and had until the end of May to issue a ruling. The decision was written by Presiding Justice Roger W. Boren and agreed to by Associate Justice Judith Ashmann-Gerst and Associate Justice Brian M. Hoffstadt. Dave Welch of StudentsMatter after the appeals hearing. Dave Welch, the founder of Students Matter, wrote in a statement, “I just got off the phone with our attorneys, and I’m not going to mince words — we lost. This is a sad day for every child struggling to get the quality education he or she deserves — and is guaranteed by our state constitution. “Every student deserves a great public education; yet California’s education laws make this impossible,” Welch said. Shannon Haber from the LA Unified communications office said that Superintendent Michelle King will not release a comment about the ruling, but specific board members may issue statements.